How Ben Simmons, Skal Labissiere, Jaylen Brown and all of the top 25 freshmen will fit in with their teams this fall in college basketball. The top high school basketball players in the country typically get significant playing time during their first college seasons. Here's SI.com will look at how each player in the 2015 Recruiting Services Index Top 25, a composite of several recruiting services, fits in with his new team. Bryant finishes effectively around the basket, protects the rim and is a strong rebounder. As a senior at Huntington (W.Va.) Prep, he averaged 17.3 points, 11.6 rebounds and 4.5 blocks per game, according to MaxPreps. Bryant also has some range on his jump shot; he connected on 32.1% of the three-pointers he attempted during his final year on the Elite Youth Basketball League circuit and his last high school season. Yet what distinguishes Bryant is an attitude and energy that Hoosiers coach Tom Crean believes is “infectious.” Bryant, who measured last year at 6’9’’, with a 7’5 ½’’ wing span, should start at center in Bloomington this season, and his presence should relieve Crean of the need to deploy small-ball lineups to counter bigger opponents. The defensive attention Bryant will command on the blocks will also free more space for one of the best crop of perimeter marksmen in the country. The Hoosiers will surround Bryant with a first-team All-Big Ten selection (Yogi Ferrell), a projected first-round NBA draft pick (Troy Williams) and four players who shot at least 40% from deep last season. On the other end, Thomas’s shot blocking ability should bolster a defense that allowed opponents to to make a Big Ten-high 54.3% of their two-point attempts during conference play, and convert more than 60% of their attempts around the rim overall, according to hoop-math.com. Dozier emerged as one of the nation’s top prospects even though he played through part of junior high and his first two years of high school with a torn ACL. According to NBCSports.com, Dozier suffered a knee injury sometime before turning 13 that resulted in a torn ACL and MCL. Though he underwent surgery on the MCL, Dozier opted to delay having a procedure to repair the ACL out of fear it would stunt his growth. Dozier told the website he “forgot” about the injury after a few years but ultimately elected to have surgery the September before his junior season at Spring Valley (S.C.) High. After releasing a top-five list of Georgetown, Louisville, Michigan, North Carolina and South Carolina the summer before his senior season, Dozier committed to the Gamecocks on the first day of the early signing period in 2014. Dozier has strong ties to South Carolina; his father and uncle played at the school during the 1980s and his sister is on the women’s basketball team. The 6'6" Dozier is a skilled ballhandler and passer but possesses the requisite length and athleticism to play on the wing. Though he’s not considered one of the better long-range shooters in this class, Dozier is proficient at beating defenders off the dribble, slashing to the basket and attacking in transition, and his combination of size and athleticism offers defensive versatility on the perimeter. This season, Dozier will join a backcourt rotation that brings back rising juniors Duane Notice and Sindarius Thornwell. It’s not clear how Martin plans to use his highest-ranked recruit, but he recently referenced former Kansas State standout Jacob Pullen when asked about Dozier, according to The Post and Courier. If you watched the United States take on Greece in the FIBA U19 World Championship earlier this month, you may have found yourself wondering why Dorsey scored 23 points for a European team and not the USA. Luke Winn outlined the hurried process that cleared Dorsey to join the Greek roster in time for the start of the tournament, which allowed him to court another heralded prospect and also set himself up to face Sean Miller, the Arizona coach he had once planned to play for. In Jan. 2014, Dorsey issued a verbal commitment to the Wildcats, but the strength of his pledge was called into question after Arizona received a commitment from five-star prospect Justin Simon in May of that year and continued to pursue other guards. Dorsey decommitted in June amid speculation that his desire to play point guard in Tucson would be thwarted by other players. He reevaluated his recruitment and, after considering offers from several programs, committed to Oregon the following February (but never signed his NLI). Even though he finished his senior season with averages of 34 points and 10.4 rebounds, led Maranatha High to a sectional championship and was named the Gatorade Player of the Year in California, Dorsey was not invited to the McDonald’s All-American Game in 2015. Oregon will need Dorsey to help replace departing guard Joseph Young, who led the Pac-12 in scoring last season. Dorsey appears likely to spend more time off the ball early in his college career, given that the Ducks added Villanova graduate transfer Dylan Ennis this spring. Either way, Dorsey’s explosiveness and ability to create separation from defenders will help Oregon maintain the offensive potency it has established under coach Dana Altman the past two seasons, when it ranked in the nation’s top 20 in adjusted efficiency, according to kenpom.com. Even though they missed out on Jamal Murray, the Ducks will boast one of the strongest backcourts in the Pac-12. Fortunately for Bragg, Kansas’s only regular-season matchup with Kentucky this season will take place on Jan. 30 at Allen Fieldhouse. Had the two teams been set to meet at Rupp Arena, Bragg probably would have faced a chorus of boos after the slip of the tongue he made while announcing his college decision in January. 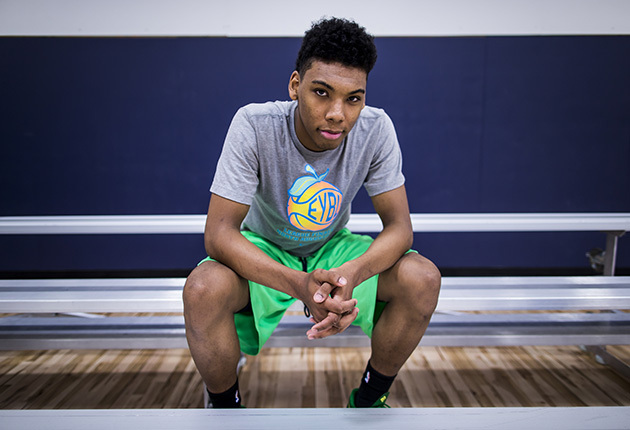 “Next year, I’ll be playing at the University of Kentucky—Kansas, I’m sorry,” Bragg said. The Villa Angela-St. Joseph (Ohio) High product picked the Jayhawks after narrowing his list of schools to five: Arizona, Illinois, Kentucky, Kansas and UCLA. At the time, Bragg was viewed as the centerpiece of the Jayhawks’ next recruiting class, but they later signed an even more heralded frontcourt player, power forward Cheick Diallo. In any case, Bragg’s commitment ensured Kansas would add a five-star caliber big man, as ranked by Rivals.com, for the fourth consecutive season. Perry Ellis, who joined the Jayhawks in 2012, is the only holdover from that group; both Joel Embiid (2013) and Cliff Alexander (2014) declared for the draft after one year in college. This season Bragg will join Ellis and Diallo to form one of the top frontcourts in the country. Whereas Ellis is a refined post scorer and Diallo excels as a shot blocker and rebounder, Bragg is highly regarded for his offensive versatility and ability to stretch defenses by knocking down jump shots. Still, it’s not clear how much playing time Bragg will earn in a rotation that—in addition to adding Diallo and bringing back Ellis—returns veterans Hunter Mickelson, Landen Lucas and Jamari Traylor. Kansas has so much depth that Bragg may play only limited minutes in his first season. There was a weeklong stretch this spring when it appeared Kennard—along with returnees Grayson Allen and Matt Jones—might have had to play point guard during his freshman season. Tyus Jones had decided to declare for the draft after leading Duke to a national title, and the Blue Devils did not have a recruit lined up to replace him. When SI.com spoke with Kennard at the Jordan Brand Classic, he said he felt he capable of playing the position. “If they want me to play the one, I’d be willing to do that,” Kennard said. “[Assistant] coach [Jon] Scheyer said, ‘Just keep working on the ball handling,’ because they’re confident in me handling the ball, whether it’s one or two. So we’ll just see how it goes.” Within a few days, a better Jones replacement plan materialized when five-star point guard Derryck Thornton committed to Duke and reclassified from the class of 2016 to '15. The addition of Thornton frees up Kennard to work off the ball as a scorer and playmaker. Regardless of how Blakeney performs in his first (and possibly only) season at LSU, many college basketball fans will remember him for something that took place before he ever arrived on campus. Blakeney committed to Louisville last September, only to rescind his pledge less than two weeks later. A tweet from a prominent recruiting analyst sparked speculation over whether Nike influenced Blakeney’s decommitment from the Cardinals, which are affiliated with Adidas, and coach Rick Pitino launched into a tirade the next month about the presence of shoe companies in recruiting. After listing Missouri, Kentucky and LSU—all of which are outfitted by Nike—as his top three, Blakeney committed to the Tigers in January. 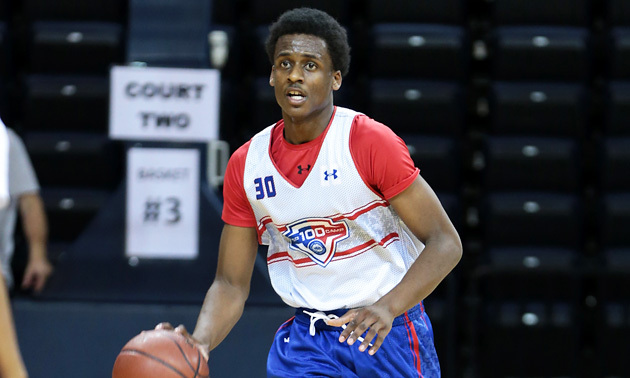 For LSU, Blakeney represented the latest addition to a recruiting class that already included the nation’s No. 2 recruit, power forward Ben Simmons. 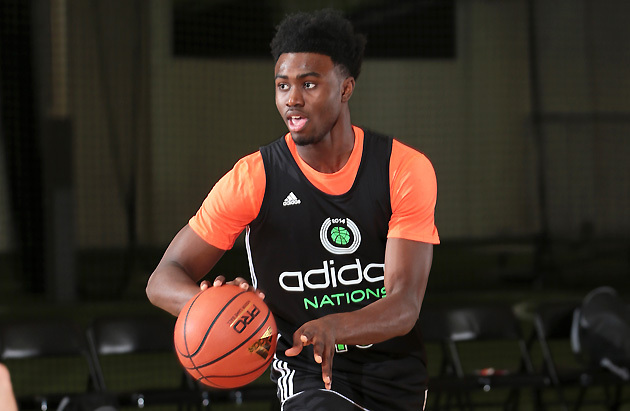 Blakeney is considered one of the best pure scorers in the class of 2015. The Oak Ridge (Fla.) High product can blow past defenders, finish adeptly around the basket or pull up for jump shots. One drawback to Blakeney’s game is his questionable shot selection. He connected on only 28.5% of the 137 threes he attempted with Each 1 Teach 1 in the Elite Youth Basketball League last year. While the Tigers could use an infusion of offensive talent after finishing 84th last season in adjusted points per possession, according to kenpom.com, coach Johnny Jones shouldn’t tolerate any excessive chucking from Blakeney given his team brings in in the potential No. 1 pick in the 2016 draft and returns its top three perimeter scorers in Tim Quarterman, Keith Hornsby and Josh Gray. Blakeney seems confident that he, Simmons and fellow top-50 recruit Brandon Sampson won’t have trouble getting up to speed next season. “I think we’ll win the national championship,” Blakeney said earlier this month, according to The Advocate in Baton Rouge. Duke cannot replace Jahlil Okafor, the No. 2 pick in this year’s NBA draft and one of the most skilled post scorers to enter college basketball over the last decade. But the Blue Devils can help offset the impact of his departure by bringing in another skilled frontcourt player. Jeter committed to the Blue Devils last August over finalists Arizona, UNLV and UCLA knowing full well the likelihood Okafor would bolt after one season. 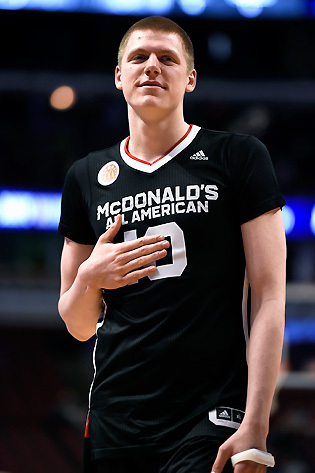 Over the past year, Jeter has prepared himself to make the leap from Las Vegas high school basketball to the ACC by continuing to refine a post repertoire centered on jump-hooks while playing alongside another one of the top big men in this year’s class, UNLV-bound Stephen Zimmerman. As a senior at Bishop Gorman High, Jeter averaged 17 points, 11 rebounds and two blocks per game, led the Gaels to a fourth consecutive state championship and was named Nevada’s Gatorade Player of the Year. Jeter, who turns 18 in September, is not as polished as Okafor at this stage but he projects as a proficient rebounder and can provide a strong low-block scoring complement to a perimeter rotation that will feature sophomore Grayson Allen, junior Matt Jones and incoming freshmen Luke Kennard, Derryck Thornton and Brandon Ingram. In the frontcourt, Duke brings back reserves Amile Jefferson and Marshall Plumlee and adds Rice transfer Sean Obi as well as three-star center Antonio Vrankovic. Tyus Jones’s decision this spring to declare for the NBA draft after a strong NCAA tournament in which he was named Most Outstanding Player of the Final Four led the Blue Devils searching for a point guard. Duke had not added a player at the position in its touted 2015 recruited class, and the program reportedly had emerged as a potential landing spot for a coveted graduate transfer. In the end, the Blue Devils came up with a better solution, when Derryck Thornton reclassified from the class of 2016 to 2015. His commitment vaulted Duke to the top of Rivals.com’s team recruiting rankings and positions the Blue Devils to reload in a manner virtually unheard of outside Lexington, Ky. By bringing in Thornton, Jeter, five-star wing Brandon Ingram and five-star shooting guard Luke Kennard, Duke will enter next season on the short list of national title contenders despite losing three first-round draft picks. Thornton, in particular, was such an important pickup because he solidifies a position that Jones handed so capably last season. The Findlay (Nev.) Prep product can beat defenders off the dribble, create scoring opportunities for others and is also considered a capable on-ball defender. "Not everyone that handles it has to be a point guard, but Derryck [Thornton] is a true point guard,” Duke coach Mike Krzyzewski said of Thornton this spring. “His ability to pressure the ball is impressive. Really, I think he does that as well as anybody I've seen in high school basketball in the next two classes. And then he's a pass-first guard. He can pressure the ball on defense, but he can put pressure on you offensively by bringing it up quickly and then getting by people to get some easy baskets for us." In addition to Thornton, Duke’s backcourt next season will feature Kennard, junior Matt Jones and title-game star Grayson Allen. Trier’s enrollment at Arizona this summer marks the next step of a journey that has seen him featured on the cover of New York Times magazine, play at four high schools in multiple states and help Team USA win gold medals at the U18 and U19 levels in consecutive summers. The 6’4,’’ 195-pound shooting guard had been on colleges’ radars from early in his prep career, but Arizona reportedly didn’t offer him a scholarship until last June. A week later, another scoring guard who had previously committed to the Wildcats, Tyler Dorsey, backed out of his pledge. Trier committed to Arizona that August, after playing under Wildcats coach and U.S. assistant Sean Miller at the FIBA Americas earlier in the summer (Dorsey was cut from the team). Trier should slide into an off-ball role in a backcourt that brings back senior Gabe York, sophomore Parker Jackson-Cartwright and junior Kadeem Allen. The Wildcats will need Trier to help fill a shot-creation void after losing their top four scorers from last season. Years before he blossomed into one of the nation’s top point guards, Briscoe was considered a talented prospect without the physical attributes to match. According to NJ.com, he was nicknamed “Boogie” in middle school on account of his uncanny dribbling skills for a chubby kid. Briscoe used yoga and boxing workouts to get into shape after transferring from St. Benedict’s (N.J.) Prep to Roselle Catholic (N.J.) High following his sophomore year. It wasn’t apparent that Briscoe profiled as a college point guard until last year, when he helped his grassroots team, the New Jersey Playaz, win the prestigious Peach Jam and posted averages of 19.2 points and 5.0 assists over 23 total games in the Elite Youth Basketball League in 2014. 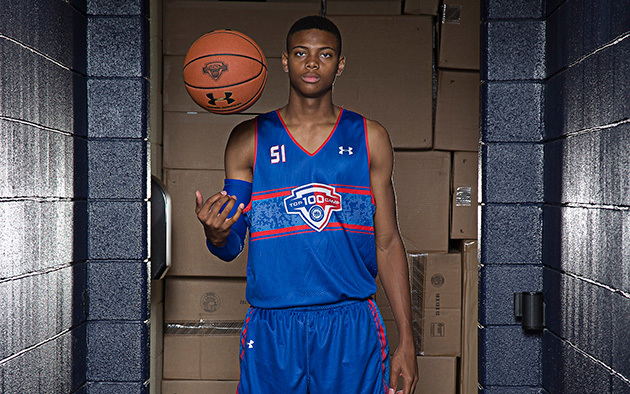 When Briscoe narrowed his list of schools to seven last July, Kentucky did not make the cut. 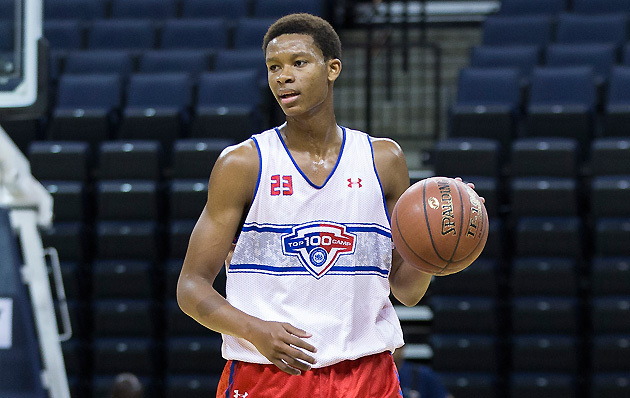 But he included the Wildcats on his top three released that October before committing to Kentucky over St. John’s and UConn in November (Skal Labissiere, Rivals.com’s top-ranked player in the class, announced he would be joining Briscoe in Lexington, Ky., on the same day). Up until recently, Briscoe seemed likely to start alongside Tyler Ulis in a two-point guard lineup. But the Wildcats recently landed a commitment from five-star guard Jamal Murray. However coach John Calipari elects to divide minutes in his backcourt, the 6’3’’, 200-pound Briscoe should excel as a freshman thanks to his ability to shed defenders off the dribble and absorb contact while attacking the rim. “Isaiah is a multidimensional guard who can play both the one and the two,” Calipari said of Briscoe in November. “He’s a big, strong guard with great ball skills that are beyond the norm. He can score the ball at will, but he’s an unselfish player who makes plays for his teammates. That's why guys love playing with him and why he's such a great teammate. UNLV coach Dave Rice has come under scrutiny for his inability to maximize the talent on his roster. That criticism won’t subside if the Rebels don’t improve this season. In Zimmerman, Rice landed one of the most talented frontcourt players in the country. He drew scholarship offers from more than 20 programs before ultimately choosing UNLV in April (he decided not to sign a National Letter of Intent). Zimmerman began drawing attention before he even played his first game at powerhouse Bishop Gorman High in Las Vegas, then helped the Gaels win four consecutive state championships. UNLV was the first school to offer Zimmerman a scholarship, and they made him a priority throughout his high school career. Rice’s brother, Grant, is the head coach at Gorman, but Rebels assistant Ryan Miller has been credited with leading the team's pursuit of Zimmerman. At 7-feet, 224 pounds, Zimmerman is renowned for his scoring prowess on the blocks, distribution skills and mid-range shooting touch. His ability to both convert from close range and to find other scoring options will elevate UNLV’s offense, which ranked 89th last season in kenpom.com’s adjusted efficiency. Though promising forward Christian Wood declared for the draft after last season, the Rebels return a solid supporting cast around Zimmerman in the frontcourt. Sophomores and former top-40 recruits Goodluck Okonoboh and Dwayne Morgan are back, and Ben Carter will become eligible after sitting out last season as a transfer from Oregon. When Wally Ellenson transferred from Minnesota to Marquette in July 2014, many observers wondered whether his more highly touted brother, Henry, would follow him to Milwaukee. Less than four months later, after narrowing his list to three schools (Kentucky, Marquette and Michigan State), Henry Ellenson committed to the Golden Eagles. Ellenson’s pledge came a few weeks after another top-100 player, shooting guard Haanif Cheatham, committed to Marquette. It also happened before former Duke assistant Steve Wojciechowski spent one game as head coach of the Golden Eagles. Moreover, the Ellenson commitment created optimism within a program that months earlier had stunningly lost its highly regarded coach, Buzz Williams, to Virginia Tech. In Ellenson, Wojchiechowski had landed a program-changing recruit who’s believed to be the highest-ranked prospect to pledge to the Marquette since Doc Rivers. Ellenson’s calling card is his offensive versatility. The 6'10", 245-pounder can score in the post but is also capable of stepping away from the paint and knocking down jump shots. He was named the Gatorade Player of the Year in Wisconsin in 2015 after averaging 27.4 points, 12 rebounds, 2.4 blocks and 1.8 assists per game as a senior at Rice Lake High. Ellenson will step into a different situation than many of his fellow elite recruits. Marquette won only 13 games last season and it could struggle to compete with Villanova, Georgetown and others in the Big East after losing five of its top eight scorers. Into the breach steps Ellenson, the centerpiece of a five-man recruiting class ranked 15th in the nation by Rivals.com. Expect him to shoulder big minutes and use a lot of possessions while breathing life into an offense that posted the lowest adjusted efficiency and the second-worst effective field goal percentage in the Big East during conference play last season, according to kenpom.com. Ben Howland spent two seasons away from coaching after UCLA fired him in March 2013, but he wasted little time getting to work on the recruiting trail once he replaced Rick Ray as Mississippi State’s head coach this March. The next month, Newman pledged to the Bulldogs over Kentucky, Kansas and Ole Miss. It helped Mississippi State that Newman attends Callaway High in Jackson, Miss., and that his father, Horatio Webster, played for the Bulldogs in the 1990s. Meanwhile, Mississippi State had recruited Newman heavily when Ray was still in charge, and Howland benefited from assistant Korey McCray also having pursued Newman while he was at LSU. Newman arrives in Starkville, Miss., with an impressive resume. As a high school senior, he averaged 29.8 points, 5.7 rebounds and 4.2 assists, earned his second Gatorade state player of the year award and led Callaway to a 31-2 record and its fourth consecutive state championship. While he may only stay at Mississippi State for one season before leaving for the NBA draft (DraftExpress currently pegs him as the No. 6 pick in 2016), Newman can spark a Bulldogs offense that finished 255th in the country in adjusted points per possession last season, according to kenpom.com. The 6'3", 178-pound Newman is one of the best pure scorers in this class, though he may need to rein in his shot selection to be more successful against better defenses. He can drive past opponents off the dribble, knock down jump shots and finish at the rim. He can excel off the ball, but Howland has indicated that his plan is for Newman to play point guard, possibly alongside the returning I.J. Ready in some instances. Newman’s versatility should help Howland sort out his backcourt rotation as the Bulldogs bring back their top three guards from last season in Ready, Fred Thomas and second-team All-SEC selection Craig Sword. Whatever the reasoning behind his decision, there may be no program at which Stone would have had a better opportunity to compete for a national championship in his first season. In College Park Stone will be expected to serve as the frontcourt centerpiece of a team pegged No. 4 in SI.com’s offseason power rankings, as the Terrapins bring back projected NBA draft picks Jake Layman and Melo Trimble, and adds a pair of transfers in Rasheed Sulaimon and Robert Carter, the former of whom is a graduate transfer from Duke and the latter of whom sat out last season following his transfer from Georgia Tech. Stone is renowned for his inside scoring repertoire. Scout.com Director of Basketball Recruiting Evan Daniels told SI's Luke Winn last July that Stone is “probably the best high-school post scorer we've seen since DeMarcus Cousins. He's just polished on the offensive end. He's not physically dominant yet, but he has terrific hands, great touch, he can hit hooks over both shoulders, he has counter moves, and he can step out and hit jump shots." Opponents will have a tough time accounting both for Stone’s ability to catch and convert on the low block, and a strong cast of strong perimeter shooters including Layman, Sulaimon, Trimble and Jared Nickens. By the time Diallo announced his college decision in late April, Kansas had already positioned itself as the odds-on frontrunner in the Big 12. Five-star big man Carlton Bragg chose the Jayhawks, and All-Big 12 forward Perry Ellis had decided to return for his senior season. The addition of Diallo pushed Kansas into the national title conversation and deprived Iowa State, Kentucky, Pittsburgh and St. John’s—his four other listed finalists—of one of the top frontcourt prospects in this class. Diallo, a native of Mali who grew up playing soccer, was named the Gatorade player of the year in New York in 2015 after averaging 17.6 points, 10.5 rebounds and 2.5 blocks per game as a senior at Our Savior New American School and shone during this year’s postseason event circuit, earning Most Valuable Player honors at the McDonald’s All-American game and co-MVP honors at the Jordan Brand classic. The 6'9", 218-pounder is an active shot blocker and rebounder, but he distinguishes himself from other big men with his work rate and intensity. Diallo should fit well in Kansas’s frontcourt. Whereas Ellis is a skilled post scorer with limited explosiveness and shot-blocking ability, Diallo is a top-notch athlete who will chase rebounds on both ends, swat plenty of shots and deter opposing ball handlers from driving to the rim. The Jayhawks won’t need Diallo to put up big scoring numbers because, in addition to Ellis and the offensively-skilled Bragg, they return a deep perimeter rotation that includes point guards Frank Mason and Devonte’ Graham, and wings Wayne Selden Jr., Brannen Greene and Svi Mykhailiuk. Kentucky was one of the biggest losers of the spring signing period. The Wildcats failed to land several five-star prospects they coveted, including Stephen Zimmerman (UNLV), Malik Newman (Mississippi State), Cheick Diallo (Kansas) and Jaylen Brown (California). The succession of misses was jarring, considering the success John Calipari has had plucking the nation’s top high school players since he became Kentucky’s head coach in 2009. Simmons is considered one of the leading candidates to be selected No. 1 overall in the 2016 draft; DraftExpress currently projects him at No. 2, behind only Labissiere. Accordingly, LSU is using Simmons as the focal point of a new advertising campaign. Kentucky will enter this season as the clear favorite in the SEC, but LSU, with Simmons scoring and playmaking, could push for second place despite losing forwards Jordan Mickey and Jarrell Martin to the NBA. Arizona transfer big man Craig Victor will be eligible at the end of the fall semester, and the Tigers return a strong perimeter rotation featuring junior Tim Quarterman, seniors Josh Gray and Keith Hornsby and incoming recruits Blakeney and Brandon Sampson.